Maximize your performance and your college admissions profile in Anchorage. SAT Subject Tests (formerly called SAT IIs) are hour-long multiple choice tests covering specific subjects in math, science, history, or languages. Many colleges, especially the more selective ones, require or recommend students to submit SAT Subject Test scores as part of their application. 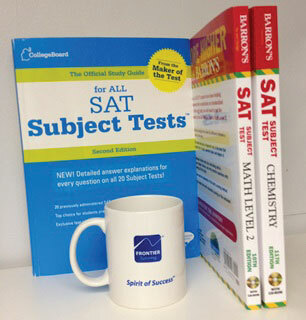 SAT Subject Tests are a great opportunity for you to demonstrate your academic strengths in particular subjects. Frontier Tutoring can help you maximize your SAT Subject Test scores and stand out as an applicant. Our one-on-one, individualized SAT Subject Test Prep programs cover both content and strategy so you can hone your skills, supplement what you learned in class, and be well prepared for test day. How long is the program? How does scheduling work? Each SAT Subject Test prep package includes 6 hours of one-on-one, individualized instruction (typically conducted over four sessions of 90 minutes each). We’ll work with you and your student to schedule the instruction at times that work best for you. We serve students from our center in Anchorage. What happens during the sessions? What materials do you use? We will work through problems and practice tests in order to develop fundamental test-taking skills for SAT Subject Tests such as timing and guessing strategy, as well as to identify and work on content knowledge gaps. We may assign one or two practice tests (each one hour in length) to complete at home in between sessions. Each SAT Subject Test prep package includes 6 hours of individualized instruction, curriculum, and practice tests, a highly practical investment in improving your student’s college admissions profile. What if I want more than 6 hours of prep? Please Note: The 6-hour standard program length presumes that students have already completed (or are close to completing) the high school class(es) corresponding to the SAT Subject Test in question (e.g., we presume that a student preparing for the Chemistry SAT Subject Test has already taken, or is close to completing, high school chemistry). Certain programs may be subject to availability. SAT is a registered trademark of The College Board.